A rheostat is a variable resistor which is used to control current. They are able to vary the resistance in a circuit without interruption. The construction is very similar to the construction of a potentiometers. It uses only two connections, even when 3 terminals (as in a potentiometer) are present. The first connection is made to one end of the resistive element and the other connection to the wiper (sliding contact). In contrast to potentiometers, rheostats have to carry a significant current. Therefore they are mostly constructed as wire wound resistors. Resistive wire is wound around an insulating ceramic core and the wiper slides over the windings. Rheostats were often used as power control devices, for example to control light intensity (dimmer), speed of motors, heaters and ovens. Nowadays they are not used for this function anymore. This is because of their relatively low efficiency. In power control applications they are replaced by switching electronics. As a variable resistance they are often used for tuning and calibration in circuits. In these cases they are adjusted only during fabrication or circuit tuning (preset resistor). In such cases trimpots are often used, wired as a rheostat. But dedicated 2 terminal preset resistors also exist. A rheostat is a variable resistor which is used to control the current flowing in a circuit. Several types of rheostats exist. The rotary type is the most used in power control applications. Most of the time these rheostats are using an open construction, but enclosed types are also available. Just as with potentiometers, multi-gang types are also available. 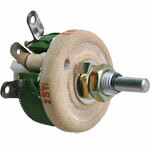 They are used to control multiple applications in parallel or to increase the power rating or adjusting range. Optionally rheostats can be equipped with a mechanical stop to limit the minimum or maximum resistance. For special applications they can also be built with tapered windings. 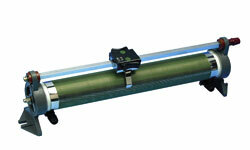 Slide rheostats are also available and often used for education and in laboratory environments. Linear or slide types are constructed of resistive wire wound on an insulating cylinder. A sliding contact is used to increase or decrease the resistance. Trimmers used as a variable resistance are very common on printed circuit boards. 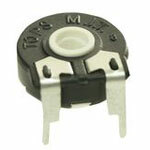 While dedicated preset resistors with 2 terminals exist, the 3 terminal trimmer potentiometer is more common and often used by wiring it as a rheostat. How to wire a potentiometer as rheostat? 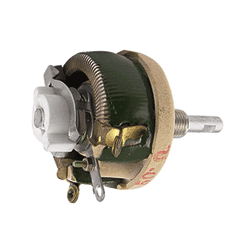 Any 3 terminal potentiometer can be wired as a rheostat by connecting one end of the resistive track and the wiper. It is best practice to connect the wiper together with the other end of the resistive track. Doing this prevents circuit interruption in case the wiper loses connection with the resistive track and reduces noise during adjustment.